Lucius Domitius Ahenobarbus (Nero) was born on the 15th of December at Annum, a small Italian seaside community, in 37 AD. He was the son of Gnaeus Domitius Ahenobarbus and Agrippina Junior., daughter of Germanicus, sister of Caligula and fourth wife to Emperor Claudius. Nero’s natural father died when he was only three years old. His ambitious mother, Agrippina Junior, had been sent into exile by her brother Caligula for plotting against him. When Claudius came to power, he recalled Agrippina in 41 AD. 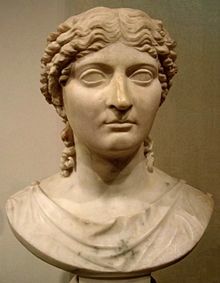 Eventually, Agrippina was able to persuade Claudius, with the help of one of his advisors, to adopt her son. It is not certain why Claudius raised Agrippina’s son above that of his own son Britannicus, but in the end, that is precisely what took place. 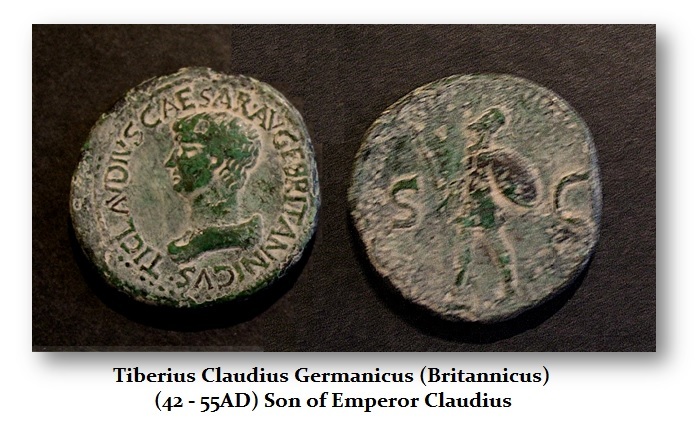 Upon his adoption by Claudius, Lucius’ name was changed to the more familiar NERO CLAUDIUS CAESAR DRUSUS GERMANICUS. This political power game between Nero and Britannicus became very obvious at the instigation of Agrippina Jr., who was extremely ambitious. She insisted upon her portrait be added to the coinage and we see numerous issues displaying her image with that Claudius (41.54AD). She was behind Nero being raised to an heir to the throne. It appears that Claudius not merely signed his own death warrant, but that of his son’s Britannicus when he accepted Agrippina as his wife. 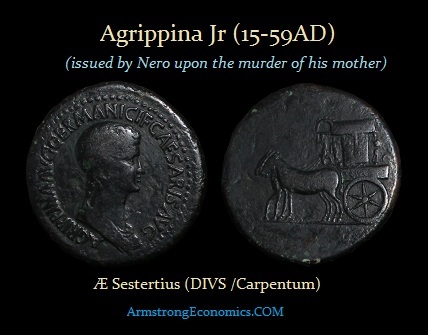 Agrippina was behind Nero first being raised to the rank of Princeps Iuventutis (Leader of Youth). Only Nero appears on the coinage at this time, not Britannicus. This is the signal that she is really in control and mapping out her usurpation of the throne for her son. 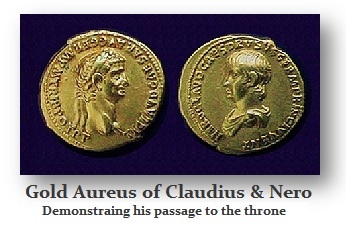 While Claudius was still alive, coinage began to appear with the portrait of Nero both by himself as well as in conjunction with Claudius as Agrippina had appeared. This confirmed for the world that Nero was the legal heir and Britannicus’ portrait was nowhere to be found in Rome. Nero was carefully trained in stoic philosophy (“Virtue for Nature’s Sake”) and rhetoric by Lucius Annaeus Seneca (4BC-65AD). For the first few years after succeeding to the throne, Nero was alleged to be under the wise influence of Seneca and Praetorian Prefect Sextus Afranius Burrus (1-62AD), the Praetorian Prefect. However, this is largely an assumption based upon the events of his later years and concluding that the early competent years were under Seneca’s influence. There is no real concrete evidence that suggests Seneca was a major political influence. With the death of Burrus in 62AD, accusations surfaced regarding embezzlement on his part. 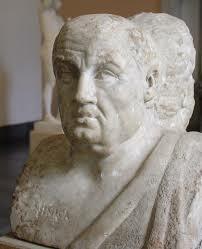 Seneca at this time retired and devoted his time again to study and writing. It does not appear that Seneca was major influence since the actions of Nero appear to be unchanged going into 64AD at the time of the Great Fire. In the beginning, Nero offered a huge donative to the Praetorian Guard to ensure their loyalty. He also delivered a wonderful speech to the Senate promising to return to the principles by which Augustus had ruled so wisely. He also promised to increase the liberties of the Senate, which naturally won their support. All of this was the master plan of his tutor – Seneca. Still, there were early signs of political ambition on the part of his mother – Agrippina Jr. On February 11th, 55 AD, Britannicus was poisoned while eating mushrooms at dinner less than four months after Claudius had died by the same method. This appears to be the work of his dominant mother, Agrippina, Jr. When Britannicus collapsed at dinner, Nero claimed that he had an epileptic seizure and the following day the body was quietly buried with as little attention as possible. All was not well behind the scenes of government. Nonetheless, it would be Nero who history tended to blame rather than his mother who killed Claudius by the same method perhaps fearing he would raise Britannicus to the throne rather than Nero. Despite his reputation in history, Nero began his reign often making rulings that pleased the lower class. Nero was criticized as being obsessed with personal popularity. Nonetheless, as his reign began in 54AD Nero forbade others to refer to him with regard to enactments he championed, which won him tremendous praised by the Senate. The following year, Nero began taking on a more active role as an administrator of the government. He became consul four times between 55 and 60, a position such as chief of state in the Senate. During this period, many ancient historians speak very highly of Nero’s character that seems to be in stark contrast with his later rule. The curious aspects of Nero’s reign appear to be a clash with the established bureaucracy that appears to have reestablished itself hiding under the Purple of the Emperor. Nero imposed restrictions upon the amount of bail and fines that could be levied on a citizen. This certainly seems to be a champion of the people in contrast to his historical image. Nero also regulated fees for lawyers limiting them so that the lower classes could be represented. Another interesting aspect of his character at this time was revealed by a discussion in the Senate on the misconduct of the freedmen class. It was proposed that patrons should have the right to revoke the freedom once given a former slave. Nero actually opposed this power and supported the freedmen ruling that the patrons had no such right. In 57AD, Nero forbade killing in circus contests and instead, he emphasized athletics and inaugurated poetry and theater competitions. Then in 61AD, he had a gymnasium and baths constructed. The Senate then attempted to pass a law in which the crimes of one slave applied to all slaves within a household. Here, there were public protests with this measure, yet Nero supported the Senate on this measure. Nero even deployed troops to organize the execution of 400 slaves affected by the law. In contrast, Nero vetoed the strong measures against the freedmen affected by the case supporting the fact that once freed, they could no longer be treated as slaves. Nonetheless, it was in the area of tax collectors where Nero seems to have clashed with the bureaucracy that set in motion his own demise. Tax collectors were accused of being corrupt and too harsh with the poor. 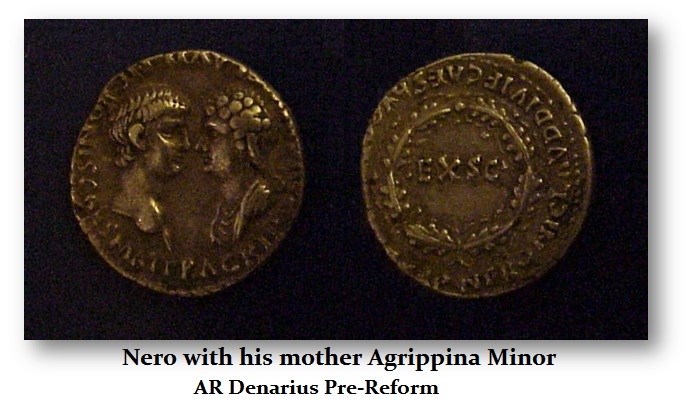 Nero championed the little guy and transferred the collection of tax authority to lower commissioners. Nero banned also any magistrate or procurator from exhibiting public entertainment for fear that the venue was being used as a method to sway the populace to support their corruption behind the scenes. Furthermore, Nero then impeached many officials for corruption and removed them from the government as well as had many arrested for extortion and corruption. As further complaints arose from the people that the poor were being overly taxed, Nero attempted to repeal all indirect taxes. The Senate convinced him this action would bankrupt the public treasury. As a compromise, taxes were cut from 4.5% to 2.5%. Additionally, secret government tax records were now ordered to become public, similar to the $2.3 trillion in missing funds handed to the Pentagon that 911 covered up. To lower the cost of food imports, Nero also directed that merchant ships were declared tax-exempt. None of these measures were Draconian, to say the least, but were efforts to weed-out corruption far more than modern governments are willing to carry out. Nero not only reduced taxes, he also gave slaves permission to file civil complaints against unjust masters, which was very shocking to many. 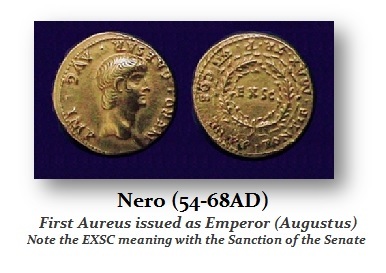 Nero also imposed a tax of 4% on the sale of slaves that was to be remitted by the seller. Nevertheless, purchasers typically found that the tax was merely added as part of the price in a European VAT fashion. Seneca, no doubt, had a hand in financial reform to improve the financial administration of the Empire. Governors were actually being prosecuted for extortion rather than the modern version of too-big-to-jail. The emperor by an edict forbade any magistrate or procurator in the government of a province to exhibit a show of gladiators, or of wild beasts, or indeed any other public entertainment. This was typically the method Governors bought favor from the people to cover-up the extensive bribery and extortion. Nero also established retirement colonies of veterans in Italy. There were simply many deeds he enacted prior to 64AD that reveal a decent administrator of the Empire. 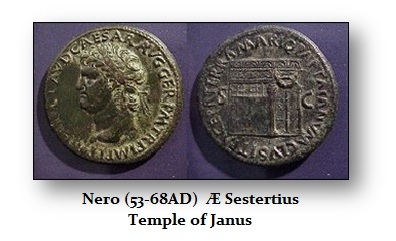 Nero even attempted to promote free trade by removing all indirect taxes. However, this proved too difficult to administer due to the pervasive corruption. After Secundus was murdered by his slaves in 61, the law allowed the execution of 400 slaves in his palace, although the urban commoners protested. The jurist Cassius Longinus proposed stronger measures to control slaves. Nero seems to have an image problem for his political enemies made him notorious for his sexual exploits. It was said that he visited brothels. Yet out of character, Nero even pardoned authors who wrote epigrams criticizing these alleged debaucheries. He was accused of criminal behavior with respect to the murder of Britannicus. 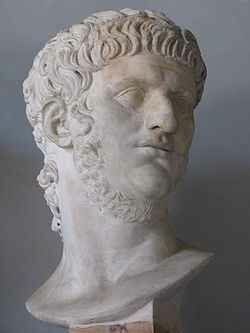 It is said that Nero roamed the streets at night with his friends attacking woman and robbing shops and mugging people. He also married two homosexual lovers Pythagoras and Sporus. It was said that Nero acted as husband to Sporus and wife to Pythagoras. This conduct does not seem to match the legislative actions and one must consider them as possible propaganda for he was trying to really weed-out corruption and protect the poor. Nero loved the arts and in imitation of the Greeks, he constructed a number of gymnasiums and theatres where he held gladiatorial displays. Nero also established the quinquennial Neronia. This was a festival that included games, poetry, and theater. Between 62 and 67, according to Pliny the Elder and Seneca, Nero promoted an expedition to discover the sources of the Nile River. It was the first exploration of equatorial Africa from Europe in history. However, Nero’s expedition up the Nile failed because water plants had clogged the river, denying Nero’s vessels access to the Sudd of present-day South Sudan. The economics of Nero’s reign has been a point of much debate. According to ancient historians, Nero’s construction projects were overly extravagant and the large number of expenditures under Nero left Treasury thoroughly exhausted. The period was riddled with deflation as shortages of money began to emerge. This was seriously impacted in 64AD when the Great Fire of Rome destroys a large portion of the city. In the year 58 AD, Nero seems to have fallen passionately in love with one Poppaea Sabina who was said to have been very beautiful. She was already married to Marcus Otho, who would later become a brief future emperor during the subsequent Civil War. Otho was actually one of Nero’s best friends. Otho was appointed a governor of Lusitania and Poppaea was moved to Nero’s bed. Despite the murder of Britannicus, Nero remained married to Octavia (daughter of Claudius, sister of Britannicus) at the manipulation of his mother. The marriage was politically important and his advisors, along with his mother, opposed any divorce in favor of Poppaea. Nero began to lash out at his mother, Agrippina Junior, for the restraints she was keeping on him, especially in opposing Nero’s divorce. But we must consider that Agrippina was not a very nice person. Nero finally engineered Agrippina’s death in 59AD by stabbing, after several unsuccessful attempts, including a staged shipwreck (she was a very good a swimmer). He then issued coins in her honor announcing she was now a god in the normal tradition. 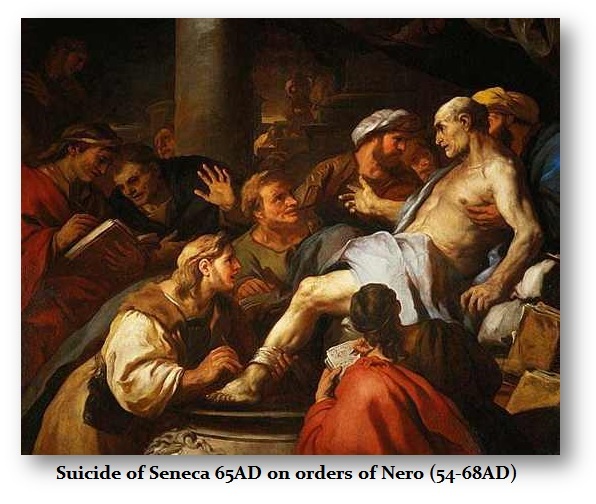 In 62 AD, Burrus died and Seneca retired, leaving Nero without great influence. Nero was now alone and Octavia was initially sent off to Campania and then finally imprisoned on false charges of adultery. Within the year, she was murdered and her head was brought back to Rome so that Nero could show it to Poppaea as the story goes. Thereafter, Poppaea, and Tigellinus, the new Praetorian Prefect, encouraged Nero’s licentious tendencies. Nero’s obsession with conspiracies, both real and imagined, led to the condemnation of many suspects, most of whom were innocent, including Seneca himself. His enthusiasm for art, poetry, and sports, particularly chariot racing (in which he competed in the Olympic Games, and won, although it is doubtful anyone would dare to beat him), continued to downgrade his “royal image” for posterity. Poppaea herself did not last very long. On January 21, 63 AD she bore Nero a daughter whom they named Claudia. The child survived only four months and was briefly remembered on a few colonial coinage issues. 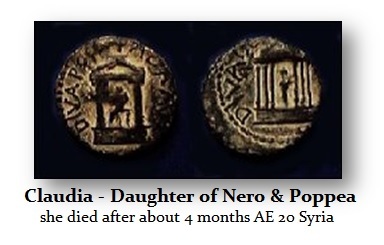 Nero did authorize coinage with her image that appears in the provinces. There is only one bronze Dupondius known to exist (illustrated here) in Latin rather than colonial Greek. By the summer of 65AD, Poppaea was pregnant again. Reportedly, Nero kicked her to death during one of his temper tantrums. 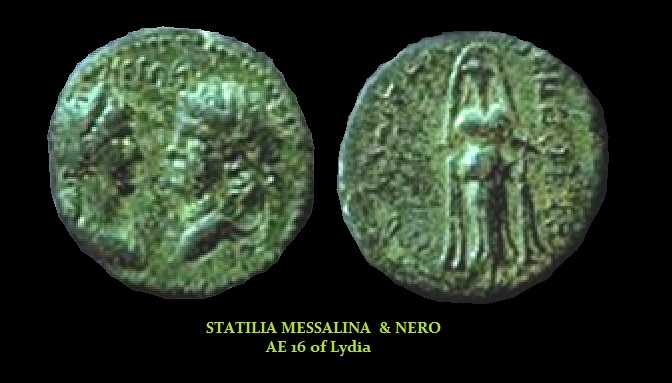 Nero’s third wife was named Statilia Messalina who he married the following year in 66AD. However, she did not please Nero and it was then reported that he reverted back to his homosexual lover Sporus, because it is said that he resembled Poppaea in appearance. The financial affairs of Rome turned down sharply when in 64AD, the Great Fire burned massive sections of the city to the ground. It was this event that created the greatest threat to Nero’s reign. It began on July 18th-19th, 64 AD and lasted for six days. The fire started at the southeastern end of the Circus Maximus in shops selling flammable goods. The extent of the fire is uncertain. According to Tacitus, who was just nine years old at the time of the fire, reported that it spread quickly and burned for about six days. It destroyed three of fourteen Roman districts entirely and severely damaged at least seven and possibly ten in total. The only other historian who lived through the period and mentioned the fire is Pliny the Elder, who wrote about it in passing. Other historians who lived through the period (including Josephus, Dio Chrysostom, Plutarch, and Epictetus) make no mention of it in what remains of their work. Hundreds of people died and many thousands were left homeless. Looters ravaged the city as authority is typically disoriented in such events. Nero enacted a public relief effort as well as significant reconstruction. The cost to rebuild Rome was immense, requiring funds the Treasury did not exactly have at that moment. It is uncertain who or what actually caused the fire, but it does not appear to have been deliberate arson. Suetonius and Cassius Dio favor Nero as the arsonist, so he could build a palatial complex. Tacitus mentions that Christians confessed to the crime, but it is not known whether these confessions were induced by torture. However, accidental fires were common in ancient Rome. In fact, Rome suffered other large fires in 69 and in 80AD. The more likely case is that society blamed Nero for he had sought to eliminate corruption within the Bureaucracy and that created enemies within his own government. It was said by Suetonius and Cassius Dio that Nero sang the “Sack of Ilium” in stage costume while the city burned. However, this was the popular legend claiming that Nero played the fiddle at the time of the fire, an anachronism based merely on the concept of the lyre, a stringed instrument associated with Nero and his performances. It was not the “fiddle” since that did not appear until the 1st-century in Rome. 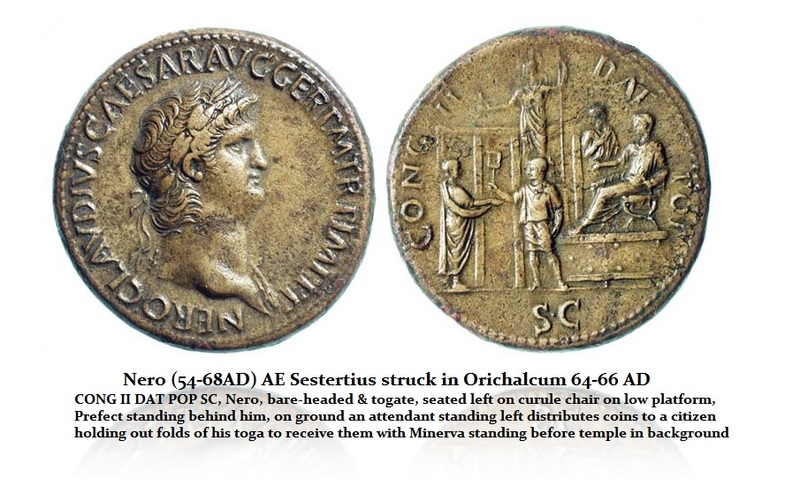 Tacitus’s account, however, has Nero in Antium at the time of the fire. Tacitus also said that Nero playing his lyre and singing while the city burned was only a rumor. These appear to be political propaganda as justification for the Bureaucracy striking back to maintain the corruption. According to Tacitus, upon hearing news of the fire, Nero returned to Rome to organize a relief effort, which he paid for from his own funds. Nero’s contributions to the relief extended to personally taking part in the search for and rescue of victims of the blaze, spending days searching the debris without even his bodyguards. These are not actions of a man who would have deliberately torched the city. Even after the fire, Nero opened the royal palace to provide shelter for the homeless and arranged for food supplies to be delivered in order to prevent starvation among the survivors. Tacitus, in one of the earliest non-Christian references to the origins of Christianity, notes that the population searched for a scapegoat and rumors held Nero responsible. To deflect blame, perhaps Nero or someone in the administration targeted Christians. He ordered Christians to be thrown to dogs, while others were crucified and burned. But the citizens of Rome did not believe that the Christians had anything to do with the affair and preferred the political forces in play used this to blame Nero claiming he was trying to deflect blame. 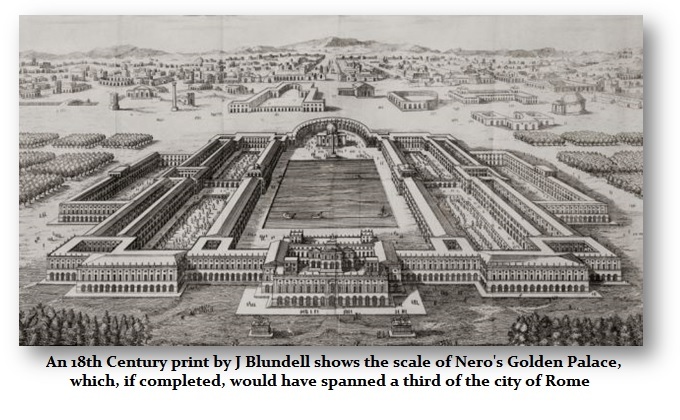 In was in the aftermath of the fire, that Nero began his new urban development plan. Houses after the fire were spaced out, built in brick rather than wood, and they were faced by porticos on wide roads. A number of other major construction projects occurred following the Great Fire of 64AD. Ironically, increasing spending on public works to stimulate the economy has remained to this day one attempt by every state to restart the economy during an economic decline. What Nero did was not that different from Franklin Roosevelt during the Great Depression. Nero had the marshes of Ostia filled with rubble from the fire and he began the project for the creation of the Port of Ostia. Of course, the reconstruction of the Port of Ostia had begun by Claudius, but the Great Fire changed the course of events and Nero expanded the project and finally completed it announcing its construction with the issuance of a famous sestertius (pictured here) displaying a map of the new Port at Ostia. In fact, it would be this design that would ultimately serve as the model for the entrance to Saint Peter’s at Vatican City. 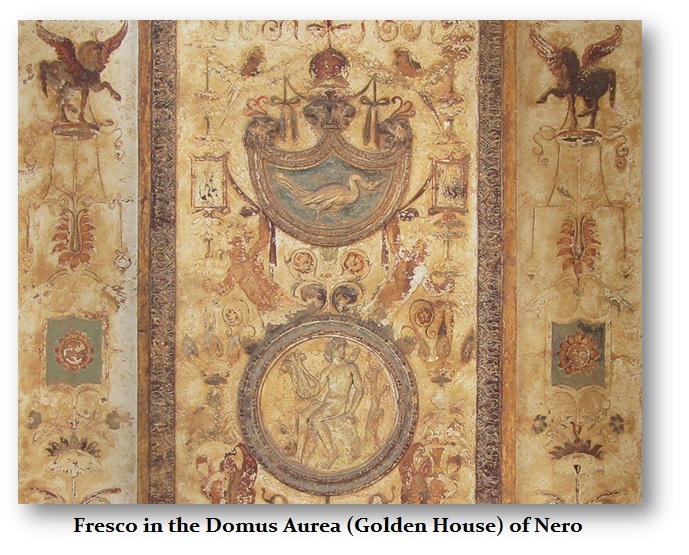 One of the great building projects in the aftermath of the fire was Nero’s new palace complex known as the Domus Aurea in an area cleared by the fire. This included lush artificial landscapes and a 30-meter-tall statue of himself, the Colossus of Nero (from which the Colosseum takes its name). The size of this complex is debated (from 100 to 300 acres). To find the necessary funds for the reconstruction, tributes (taxes) were imposed on the provinces of the empire. Nero remains best known for this palace since, after the fire of 64AD, which destroyed the greater part of the center of Rome, Nero had this construction with its walls sheathed by fine marbles and vaults decorated with gold and precious stones, so to earn the name of Domus Aurea (Golden House). It was designed by the architects Severus and Celer and decorated by the painter Fabullus. Here too, we find that Nero also proudly displayed this project on his coinage. True, it was luxury for him, but with such a massive portion of the city destroyed, unemployment must have been excessive. This project would have been like the WPA during the Great Depression of the 1930s. The enormous complex included boundless vineyards, pastures and woods, an artificial lake, treasures looted from the cities of the Orient, and precious ornaments, such as a statue of the Emperor in the robes of the Sun God. This construction project led to the rumor that Nero intentionally set the fire so he could build his Golden House. In 67, Nero attempted to have a canal dug at the Isthmus of Corinth. Ancient historians state that these projects and others exacerbated the drain on the State’s budget. 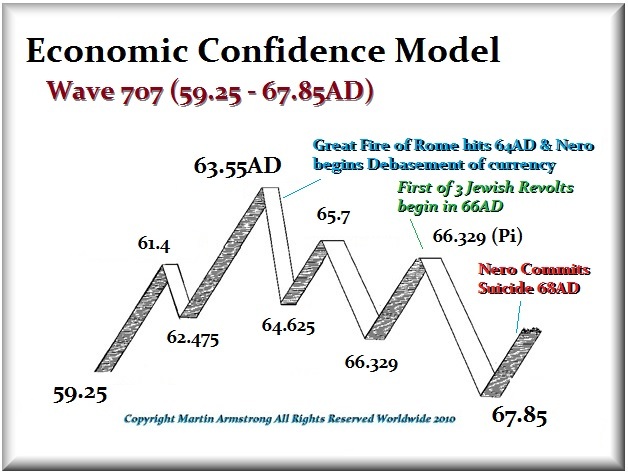 However, they were clearly attempting to restart the economy that collapsed with much of the city of Rome destroyed. The economic impact of the Great Fire resulted in Nero’s debasement of the coinage for there was spending on public works projects and charity intended to ease economic troubles as demonstrated by his coins that depicted Nero providing assistance to the poor. As the economy turned down sharply, Nero increased his spending in the classical Keynesian model, yet it failed to reverse the economic decline. As was the case with Caligula, it appears that during the reign of Nero, his administrators turned to treason trials, confiscation of assets and raising taxes. The coinage was even debased setting in motion a long-term trend that would end only during the 3rd century. 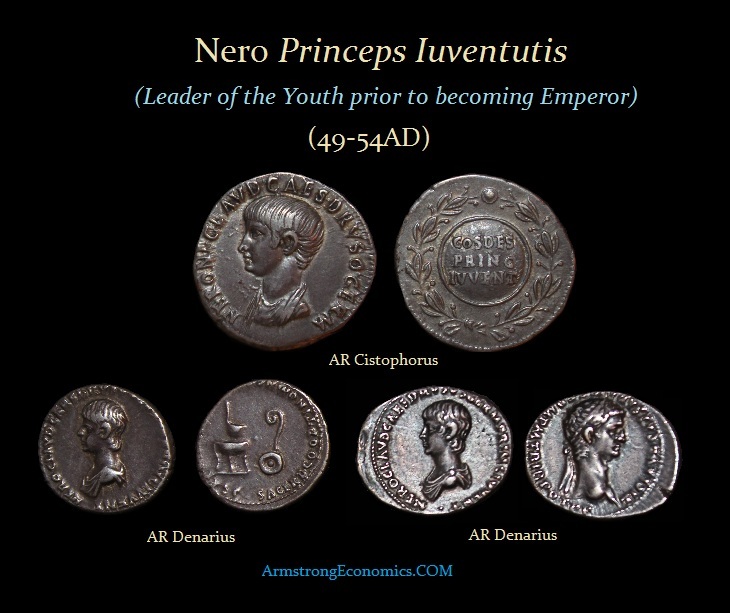 Nero debased the metal content of the Roman currency to increase the money supply for the first time in the Empire’s history. He reduced the weight of the denarius from 84 per Roman pound to 96 (3.85 grams to 3.35 grams). He also reduced the silver purity from 99.5% to 93.5%—the silver weight dropping from 3.83 grams to 3.4 grams. 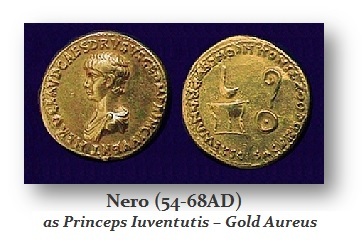 Furthermore, Nero reduced the weight of the aureus from 40 per Roman pound to 45 (8 grams to 7.2 grams). There was no empirical evidence that Nero set fire to Rome and it is more likely that he was blamed as part of a continued effort to dethrone him and restore the Republic with all its former corruption intact. His actions before and during clearly demonstrate he was not a tyrant as was Caligula, his mother’s brother. It is clear that tensions began to rise because of the declining economy and the destruction of so many businesses in Rome would have sent the unemployment rolls soaring. It is interesting to note that Nero in 65AD extended the welfare system of free grain to his personal guard – the Praetorians. This action demonstrates that he was aware of the rising civil unrest. Under Augustus (27BC-14AD), the number of people eligible for free grain in Rome had increased to 320,000. In 5 B.C., however, Augustus began restricting the distribution. Eventually, the number of people receiving grain stabilized at about 200,000. Apparently, this was an absolute limit and corn distribution was henceforth limited to those with a ticket entitling them to grain. Therefore, extending the free grain to Praetorian guard in 65AD is a reflection of security concerns. It was, in fact, Nero’s passion for architecture that gave rise to the most famous of all aspects of his life. Perhaps Nero is best remembered for his rumored part in the Great Fire of Rome of 64 AD. Fires throughout Rome’s poorer sections were commonplace, and sometimes intentionally begun by the authorities to clean out the rats and garbage that always collected. Nero was blamed for the great fire, which destroyed half of Rome. It began in the neighborhood of the Circus Maximus on July 19th. The fire spread quickly leaving only 4 of the cities 14 regions untouched. Even portions of the imperial palace on the Palatine Hill were destroyed. 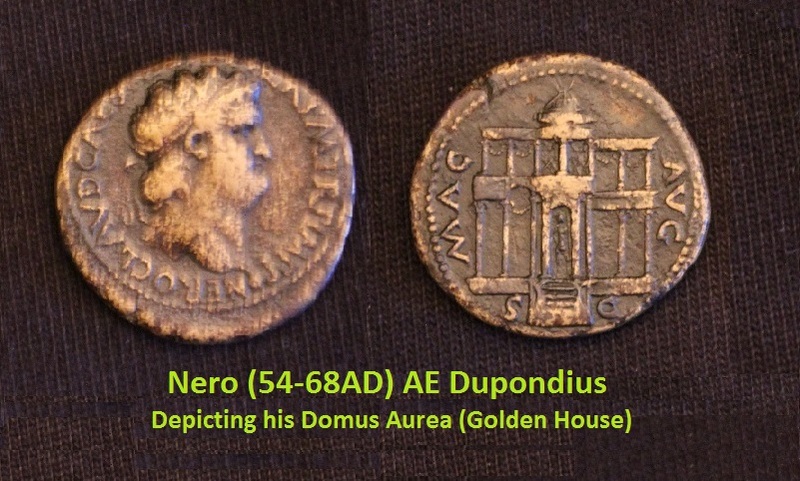 Nero was at Antium at the time the great fire began in 64 AD. He did rush back to Rome when he heard of the magnitude of the disaster. Nero responded in a responsible way organizing relief, cheap grain and took part in the reconstruction plans. That is the part that perhaps led many to blame him for starting the fire in order to expand his new Golden House. Of course, Nero’s reputation was not helped by stories that he stood in the tower of Maecenas watching the disaster only to remark about the “beauty of the flames” as he sang the entire song of the “Sack of Ilium” (his own composition) while dressed in a stage costume. Nero increased taxes and even put to death six large landowners in Africa. Like Caligula, when he began to run out of money, Nero resorted to robberies and cruel blackmail. According to Dio Cassius, many were put to death, while many others purchased their lives from Tigellinus for a great price. The First Jewish–Roman War (66–73 CE), sometimes called The Great Revolt (Hebrew: המרד הגדול‎, ha-Mered Ha-Gadol, Latin: Primum Iudæorum Romani Bellum), was the first of three major rebellions by the Jews of Judaea Province (Iudaea) against the Roman Empire. The second was the Kitos War in 115–117, and the third was Bar Kokhba’s revolt of 132–135. The Great Revolt in Judea began during the year 66 AD, originating in the Greek and Jewish religious tensions on the surface, but beneath it was about economics and taxes. The crisis escalated due to anti-taxation protests and attacks upon Roman citizens. Nero had set up in 55AD Aristobulus of Chalcis as King of Armenia Minor and participated with his forces in the Roman-Parthian War of 58–63 AD, where he received a small portion of Armenia in exchange making him king. 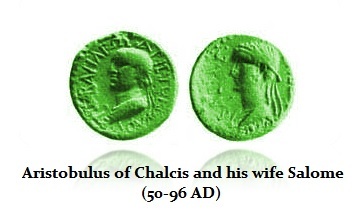 Aristobulus was a son of Herod of Chalcis and his first wife Mariamne and the great-grandson of Herod the Great. Nero added four cities to young Agrippa’s kingdom and appointed Marcus Antonius Felix (52-58AD) procurator of the remainder of Judea. The brigandage (brigands) were people who lived by pillage and robbery that was rampant in Judea at that time. Felix was friendly with the men known as “dagger-men” (sicarii), who mingled in crowds and stabbed opponents with short daggers. Felix was reprimanded by the high priest Jonathan for engaging in such practices. Thereafter, that cleric was murdered by the sicarii. Aristobulus in turn then appointed Ishmael II as high priest, who then had his family compel landowners to pay them all tithes, thus taking away the income of the lower priests. The corruption in Jerusalem was simply massive and this rising taxes sparked civil unrest. Roman cohorts were now required to subdue a revolt led by an Egyptian Jew. The whole affair escalated and now Greeks were fighting Jews over who would control Caesarea in in modern Turkey. Eventually, the Greeks bribed Sextus Afranius Burrus to have Nero deprive the Judeans of civil rights. At two-year intervals the greedy Felix was succeeded by Festus, then Albinus in 62AD and Florus in 64AD. In June of 65AD the Jews decided not to pay taxes to Rome. This tax rebellion prompted Florus to seize 17 talents (17,653 ounces) from the Temple treasury as back-taxes for the entire province (1 Talent = 32.3 kilograms (71 lb)). The entire crisis deteriorated into a situation, according to the historian Titus Flavius Josephus (37-100AD) that spiraled down with each governing worse than his predecessor. Albinus increased taxes, released bandits for money, and was bribed to ignore the crimes of the sicarii. The Rule of Law simply collapsed mired in corruption. As the Jews rebelled, the Romans responded by not just plundering the Second Jewish Temple for back taxes, but they also executed up to 6,000 Jews in Jerusalem. This merely prompted a full-scale rebellion that broke out based upon Pi target for that Wave 707 of the Economic Confidence Model. 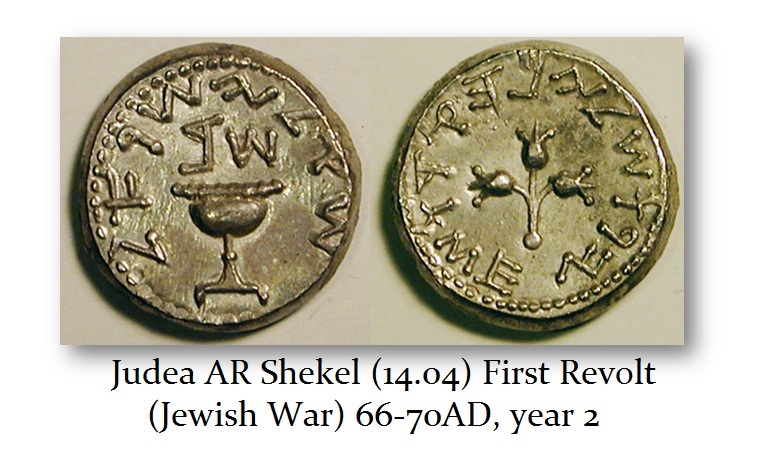 The Jews began to issue their own coinage. The Roman military garrison of Judaea was quickly overrun by rebels, while the pro-Roman king Agrippa II, together with Roman officials, fled Jerusalem. As it became clear the rebellion was getting out of control, Cestius Gallus, the legate of Syria, brought in the Syrian army, based on XII Fulminata and reinforced by auxiliary troops, to restore order and quell the revolt. Despite initial advances and conquest of Jaffa, the Syrian Legion was ambushed and defeated by Jewish rebels at the Battle of Beth Horon with 6,000 Romans massacred and the Legion’s aquila lost – a result that shocked the Roman leadership. This defeat of the Roman legions called for a major response. The competent General Vespasian was given the task of crushing the rebellion in Judaea province. His son Titus was appointed as second-in-command and they marched against Judea with four legions. Vespasian invaded Galilee in 67AD. Finances of the state were already strained as the economy turned down in mid-63AD. 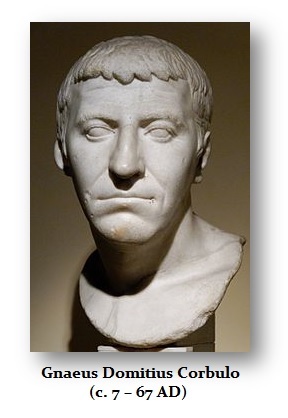 A plot emerged led by Gaius Calpurnius Piso (? – 65AD) in which Nero was to be assassinated while attending the Circensian Games in April of 65 AD. Piso appears to have emerged from the senatorial anger with the Nero to gain his own political power. They were outraged that Nero had defended former slaves and the lower classes and has actually prosecuted corruption disturbing the balance of power. By 62 AD, there had been talking among those of senatorial rank, the nobility, and among the Equities that Nero was ruining Rome with these liberal policies. The Great Fire of Rome in 64AD and the subsequent blaming of Christians that began the first persecutions seems to have caused several groups of conspirators of various causes to come together under the leadership of Piso adopting the same goal – the elimination of Nero. On April 19th, 65 AD, the freedman Milichus betrayed Piso’s plot to kill the emperor and the conspirators were all arrested. In all, 19 were put to death and 13 exiled, revealing the massive scope of the conspiracy. Several senators and others were involved. When the plot was revealed, a full-scale witch-hunt began. Piso was ordered to commit suicide and so killed himself. The Pisonian conspiracy was a major turning point for Nero that shook his confidence. It was at this time that Seneca who was caught up in the aftermath of the Pisonian conspiracy, and Nero ordered him to commit suicide. The plot reflected the growing discontent among the upper social strata of the Roman state with Nero’s attempts to root out corruption and protect the lower classes and slaves. This was clearly a clash between the PUBLIC (bureaucratic administration) and the PRIVATE sector being the people. This event contributed to the conclusion of this conflict that culminated in the eventual suicide of Nero, and the chaos that followed engulfing the Roman world in Civil War and an attempt to separate various regions from Roman rule. Another plot was discovered while Nero was planning a tour of Greece again involving leading senators including a distinguished general, Gnaeus Domitius Corbulo (7-67AD), who was the brother-in-law of the former Emperor Caligula and Agrippina, Jr. as well as the father-in-law of Vespasian’s son and future Emperor Domitian. This time Nero regarded the Senate as his enemy and he was suspicious of Corbulo after two failed plots by noblemen and senators that previously included Corbulo’s son-in-law, Senator Lucius Annius Vinicianus back in 62AD. In 66AD when disturbances broke out in Judaea and Nero, directed Vespasian to take command of the Roman forces for the invasion and summoned Corbulo, with his two brothers who were the governors of Upper and Lower Germany, to Greece. Upon Corbulo’s arrival at Cenchreae, the port of Corinth, Corbulo was greeted by Nero’s messengers who delivered orders to commit suicide. Corbulo obeyed by falling on his own sword, saying, “Axios!”, meaning “[he is] worthy” that is an acclamation of faith. Nero then returned from his Greek tour to Rome in 67 AD upon receiving word that a new rebellion was erupting in Gaul (France). The relationship between him and the Senate had reached an all-time new low as Nero distrusted everyone. 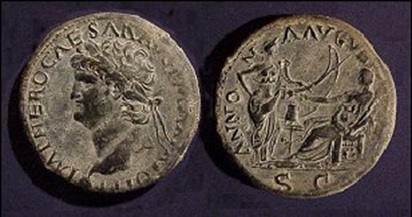 Nero’s tax increases in the provinces had also weakened his support. The cost of erecting his Golden House during an economic decline was the symbol of corruption and abuse that Nero had fought so hard against. Nevertheless, it was in March of 68AD when a revolt in Galla Lugdunensis (France) broke out led by Gaius Iulius Vindex (? – 65AD), who was the governor at the time. This would be the first rise of Gaul whereas the next attempt to separate would come about 200 years later and then the third attempt under Charlemagne. Vindex in 65AD had no legions at his command but he did attract the attention of many. He collected from various parts of Gaul a force of about 100,000 men, but they were not professional soldiers. The districts of the Arverni and the Sequani joined in the movement, as well as to the East as far as Vienna on the Rhone, which became a center for the rebellion. However, Lugudunum (London), which was the capital of the Three Provinces, did not join. Lingones and the Treveri on the borders of Germany also stood aloof. Vindex issued extensive coinage. However, the coins did not picture his image. They utilized various images of gods and invoked the image of Augustus (27BC-14AD). 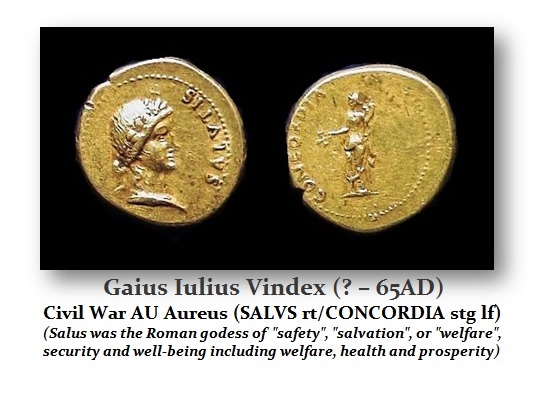 They are quite rare in comparison to Roman coinage and would later display the mark of being sanctioned by the Senate (SC and SPQR) when issued by Galba. Vindex also gathered the support of the governor of Hispania Tarracomensis (Spain) –Servius Sulpicius Galba (b 3BC; 68-69AD). It is clear that Vindex’s ultimate intentions were not to march upon Rome, but he sought to break-away from Rome and restart the Celtic empire of Gaul. It is clear that the rebellion in Judea during 66AD sought the same goal – separation from Rome. It was clear that Nero had no natural heir. He was the last of the Julio-Claudian line and there was a rising belief that the Imperial Empire of Rome was at an end. Vindex thus was of Celtic royalty and conceived the idea of a kingdom of Gaul, ruled by himself, nominally perhaps dependent on the Roman Empire. It was painfully obvious that this scheme to separate from Rome was hopeless unless Vindex could induce some of the western armies to join. Vindex’s attempts to win the armies of the Rhine and Britain to his cause were futile, yet he was able to convince the governor of Spain to join his cause – Galba. Galba had distinguished himself both on the Rhine and in Africa. He was already advanced in age about 65 and in his childhood had actually seen Augustus (27BC-14AD), who had said to him, according to a report, “Thou shall one day taste our empire”. The popular stories said the oracles had predicted that an Emperor to lead Rome was to arise from Spain. Galba’s decision to join the revolt of Vindex was not rash but calculated. It was only after considerable hesitation that finally on April 2nd he named himself the legatus senatus populique Romani in a speech delivered from his tribunal, and made preparations for war. Galba’s adviser, T. Viuius, wisely counseled that he, belonging to the senatorial party, should make his declaration of rebellion take the form of declaring himself the servant of the Senate. 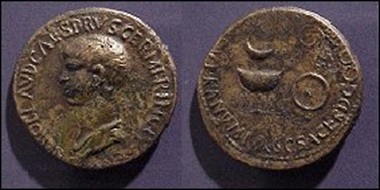 The coinage of Vindex never depicted his portrait and employed images of gods or Augustus. The early coinage of Galba adopted this same strategy removing the image of a usurper. After all, there was still an underlying current within the Senate that they would return the Empire to a Republic with them firmly in power. In Spain Galba was supported by Marcus Salvius Otho (b 32; 69AD), legatus of Lusitania, turned to Galba. 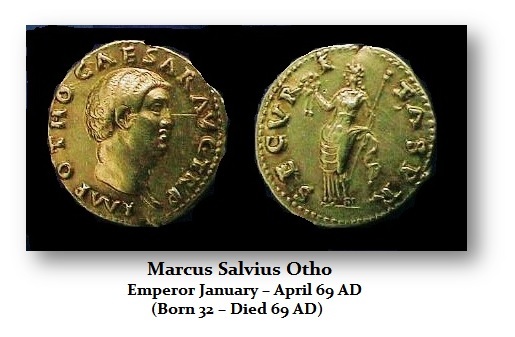 Otho himself would make a bid for power in January 69AD. 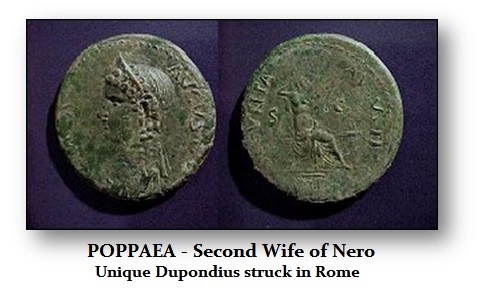 Poppaea who Nero took as his second wife had been married to Otho who was compensated by giving him his lucrative position in Spain. Otho would later bribe guards to murder Galba and seize the throne for himself. Caecina, quaestor of Baetica; also supported Galba. 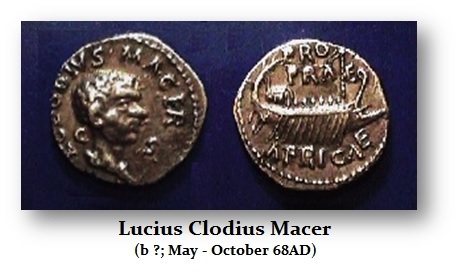 But there was concern about the legions of the Rhine and Lucius Clodius Macer (May-October 68AD), governor of Africa, who also revolted in May 68AD, cutting off the food supply of Rome creating more civil unrest in Rome for Nero. Macer had been encouraged by Galba, and he raised a legion Legio I Macriana liberatrix in addition to the Legio III Augusta that he already commanded. He issued coinage with his own portrait and this clearly raising suspicion that Macer also harbored imperial ambitions. In October 68AD, Galba ordered Macer to be killed by the procurator Trebonius Garutianus. Papirus, the centurion of Mucianus, was implicated in his assassination. When the news reached Nero about the rebellion in Gaul, he returned to Rome and took measures to crush the resistance in its tracks. He sent orders to the troops in Germany and Britain to march upon Gaul. The rebellion was crushed thanks to Lucius Verginius Rufus (15-97AD), the legatus of Upper Germany, who resisted all the endeavors of Vindex to gain him over. Verginius was indeed alarmed by the national character of the movement. This was not Judea. Gaul was a very important place since all the roads from Lower Germany and north-western Gaul, from the Rhine and from the Jura mountains, met through this province. It was extremely strategic to the empire. It was there where the great battle took place. The legions were completely victorious, and Vindex was slain at Besancon in May of 68 AD. Strangely enough, it was not exactly undying loyalty to Nero that had moved the Germanic legions to repel the advances of Vindex. Instead, it was a Celtic/Gallic uprising that was the character of this revolt that threatened separation. Following the victory, the German legions proclaimed their general Imperator demonstrating that they had no loyalty to Nero either. Nonetheless, Rufus refused the honor. Rufus was a man of lowly birth and perhaps thought that he had no chance of being accepted by the nobility of Rome. In the inscription for his tomb, which he composed before his death, he mentions as the two creditable actions of his life his victory over Vindex and his refusal of the Empire. After the failure of the revolt in Gaul, the situation of Galba seemed doomed. Nevertheless, Galba he was saved by the Emperor’s want of resolution, and the treachery of his ministers back in Rome. When the news of the defection in Spain arrived in Rome, Nero confiscated Galba’s property, and then assumed the consulship directly himself. Nero made preparations for an expedition against Galba and appointed Publius Petronius Turpilianus (? – 68AD) as his commander. A new legion was organized from the troops of the fleet and called legio classica. Nero seemed secure with the loyalty of the praetorian guards. Nevertheless, economic conditions were declining and this caused dissatisfaction within Rome. Grain (corn) prices were at their peak for shipping had been commandeered for construction rather than food transport. When a ship arrived from Egypt filled with sand for construction rather than grain, the discontent erupted into civil unrest. It was reported that Nero entertained the idea of abandoning Rome, and sailing to Alexandria for safety and to make that the new capital of an eastern empire. 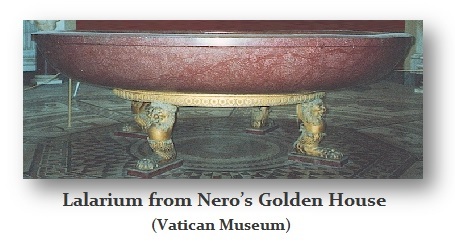 This may have been even more propaganda since it would not seem likely that Nero would have abandoned his Golden House. The Senate was very eager to overthrow Nero and embraced ideas that the Republic would rise again. Galba was in his 70s, and the Senate endorsed him as Emperor without fear that he was too old to last too long in such a position. 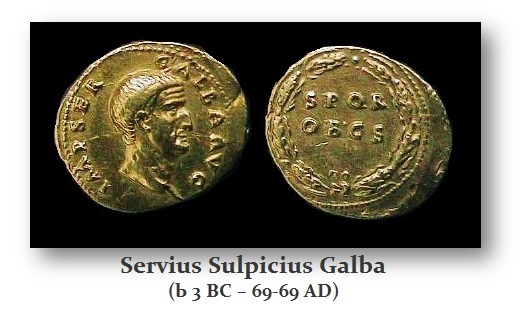 Galba began to issue coins with his portrait and noting SPQR proudly displayed showing he had the endorsement of the Senate. Indeed, the Senate did live in fear of the Praetorian Guards who had proven to be loyal to the Julio-Claudian clan. In order to draw them from their devotion to Nero, the Prefect of the Praetorian Guard, Gaius Nymphidius Sabinus (c. 35–68), had designs for power himself and thus adopted a two-prong approach. Sabinus had just become Prefect in 65AD and began a strategy to lure the loyalty of the Guard away from Nero. Sabinus resorted to an artifice and persuaded Nero, who was distracted with fear, to move from the palace to the Servilian gardens, which lay close to the Tiber River on the road to Ostia. Sabinus then went to the Praetorian Camp and informed the soldiers that Nero had deserted them and left Rome. They were easily convinced that it was now in their interest to support Galba claiming he offered a donative of 30,000 sesterces per man for their support. Sabinus knew that Galba could never fulfill such a promise and believed he could then turn the Praetorian Guards to his support to secure the throne for himself. It was a complicated plan. In the Servilian gardens, the Nero was in despair. One of the imperial freedmen, named Phaon, offered his master the refuge of a villa, about four miles north-east of Rome, on the Via Patinaria, a crossroad connecting the Via Salaria and the Via Nomentana. Nero agreed and moved by night accompanied by Phaon, Epaphroditus, and two other freedmen. Nero’s night journey has been the epic scene of the demise of the Julio-Claudian heritage. The Via Nomentana went close to the Praetorian Camp where Nero heard cheers in honor of Galba rising from the troops. The night, they claim, was highlighted with lightning and earthquakes as if the gods approved of his demise. Nero entered the villa by a narrow entrance at the back to hide even from the slaves. It was there that he pondered his fate laying upon straw for hours. “What an artist I am to perish!” he reportedly said. The Senate was at first the overjoyed by the news of Nero’s death. The Senate hastened to sentence Nero to a punishment which was almost obsolete, condemning his memory and ordered his statues to be overthrown. The intense hatred which the senatorial party felt towards Nero was clear by their actions and can be seen in literature. This had been a war of power between the Senate and Nero, who honorably attempted to eliminate corruption. The propaganda to paint Nero as a tyrant had prevailed among the perhaps the majority of the people. However, there were many who saw through this charade and Nero’s grave was adorned annually with wreaths of flowers proving that the Senate had not obliterated Nero entirely. A strange phenomenon emerged surrounding Nero. Many people doubted that he had actually died and he would return to defend the lower classes once again. They regularly looked for his reappearance. Believe it or not, this popular view of Nero the Champion of the people manifested in three false claims of being Nero were made and obtained even large followings. The Christians saw in Nero the Antichrist, and also believed that as such he would come again. Nero perished without an heir, that the line of the great Julius Caesar had come to an end and a new epoch was beginning. Nero was the last of the true Caesars—the last of the Julio-Claudian line. 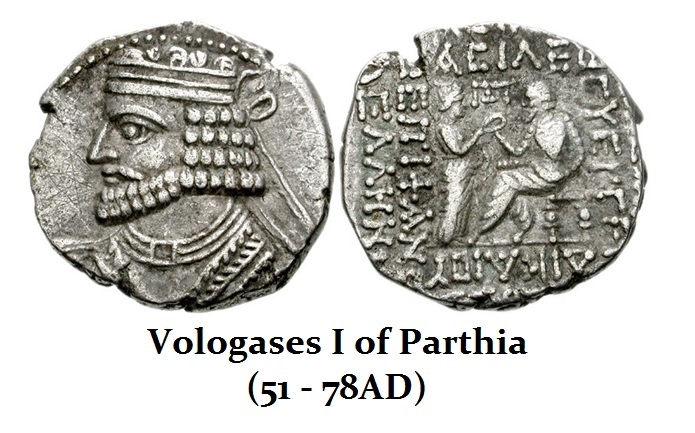 King Vologeses I of Parthia (51-72AD), Rome’s rival who was defeated by Nero, sent an embassy, requesting the Senate and the new Princeps to hold the memory of Nero in honor. This further demonstrated that much of the image of Nero was propaganda because of his war with the Senate and corruption. 55 TR.P. – TR.P.II. COS. P.M.P.P. 58 TR.P.IIII. – V. IMP.IIII. – V. COS.III. 59 TR.P.V. – VI. IMP.VI. 60 TR.P.VI. VII. IMP.VII. COS.IIII. 61 TR.P.VII. – VIII. IMP.VIII. – VIll. 66 TR.P.XII. – XIII. IMP.XI. 67 TR.P.XIII. – XIIII. IMP.XII. Note: Nero received the Tribunician power on December 9th, 54 AD, and it was subsequently renewed each year on that date. 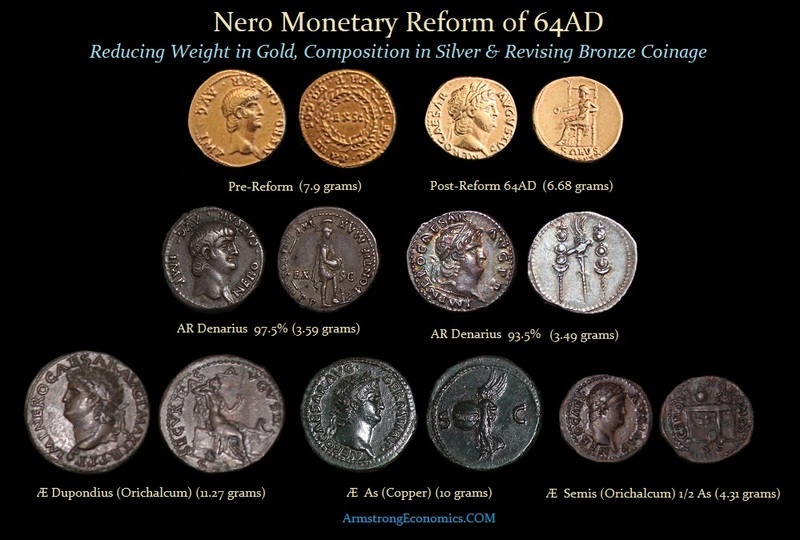 In 64 AD Nero introduced a profound Monetary Reform which was in response to the Great Fire of Rome which destroyed most of the city on July 19th, 64AD. To cover the costs of reconstruction, Nero began the debasement process. He ordered that houses could no longer be constructed of wood and had to be built of brick. He also widened the streets to prevent fires from spreading rapidily. He also constructed hi grand palace at this time as well. The weight of the gold Aureus was reduced from 7.85 grams to 7.2 grams. 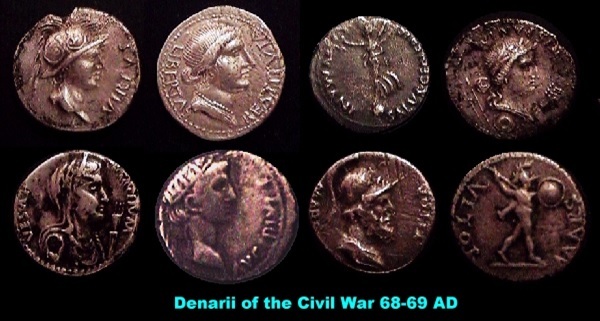 The silver coinage issued in Rome (Denarius) and in Caesarea (Drachm) was reduced from 97.5% to about 93.5% pure silver. 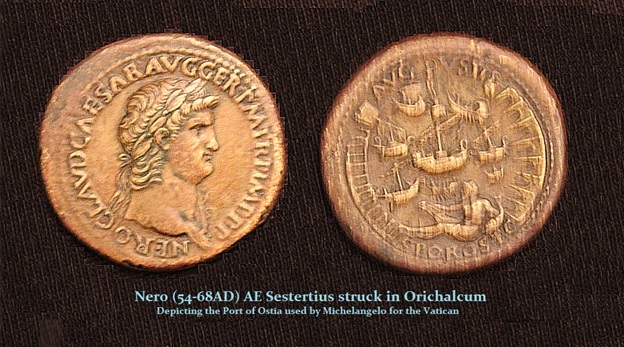 Nero also experimented with issuing the traditional bronze coinage in Orichalcum (brass). In order to render the Dupondius distinguishable from its half-denomination, Roman As, a radiate crown was added to this denomination leaving the traditional laurel wreath style portrait for the Roman As. Orichalcum was the legendary metal of Atlantis where its buildings were said to have been clad in this rare metal that looked similar to gold. Orichalcum was therefore valued at twice that of copper. The Dupondius reform prevailed until the end of Dupondius regular issues while the experiment in brass died out following Hadrian (117-138AD). This distinction of a radiate crown was applied during the Monetary Reform of Caracalla who created the double denarius known as the Antoninianus.